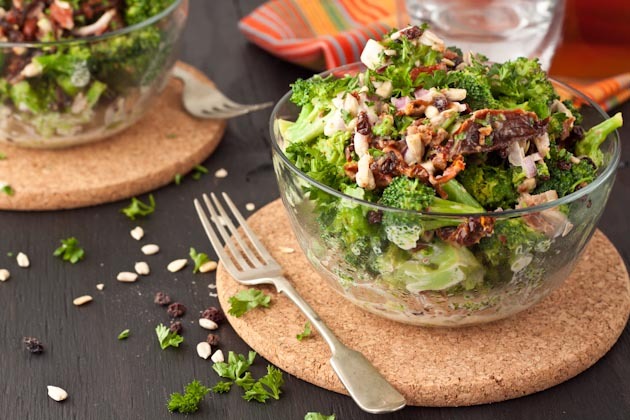 Creamy broccoli salad made dairy-free, low-carb and paleo-friendly. Lightly steam the broccoli for 2-3 minutes, just until the florets are crisp tender. This is optional, I just find broccoli easier on my digestion when it’s lightly steamed. Place in a large bowl and set aside. Fry bacon as per package instructions. Be sure to cook until crisp. We like beef bacon because it’s higher in protein, easier on digestion, a has less fat. Plus it tastes so good! Once cooked, set on a paper towel lined plate. Pat dry and break up into small pieces. 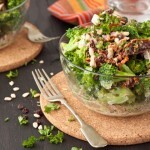 Add bacon, sun dried tomatoes, currants, sunflower seeds and red onion to the broccoli bowl. In a separate small bowl, combine dressing ingredients and stir until incorporated. Pour over the broccoli mix and stir to coat. Serve with a sprinkle of fresh parsley and enjoy!